As one of the hottest tourist spots in Seoul, you can easily find money changers in Myeongdong. There are two types though, one is the street vendor money changers, the other one is local Korean bank offering currency exchange service. Street Money Changers are plentiful at Myeongdong. You can find one almost every 20 meters to 30 meters. For that reason, you can get one of the best exchange rates in Seoul here because money changing is a very competitive business here. You can see many money changers at almost every part of the street in Myeongdong. Most money changers in Myeongdong will display their exchange rates for USD, Yen, Euro and Chinese Yuan publicly at their store. You can their exchange rates before deciding which money changer to change your money at. If you can't speak Korean language, don't worry, most money changers here understand simple English (at least the currency names). The amount of sum exchanged is usually communicated with numbers on calculators or cashier machine. 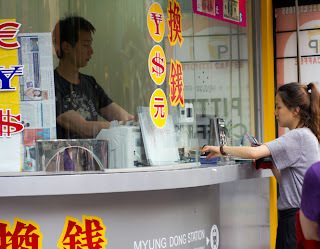 A lady exchanging money at a street money changer in Myeongdong. The street is busy all day long. So it is very safe here. If you want more privacy, try money changers located in a shop. There are plenty of them in Myeongdong too. Money Changer Shop in Myeongdong. The Exchange Counter is Located Inside the Shop for More Privacy. Street money changers in Myeongdong usually operate from 10am in the morning to 10pm in the evening, same as most of the other shops and outlets in Myeongdong. 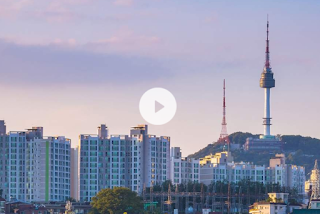 For those who are more comfortable dealing with bank, or who would like to exchange a very large sum of money, you could also visit a local bank offering currency exchange service in Myeongdong. Bank Offering Currency Exchange Service in Myeongdong. 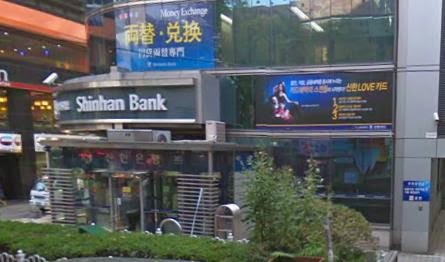 If you stay at Nine Tree Hotel, Myeongdong, you can exchange money at Shinhan Bank which is right opposite the hotel. Shinhan Bank opposite Nine Tree Hotel offers Currency Exchange. Unlike the street money changers, banks only open during office hour of 9am to 5pm. After office hour, your only option is the street money changers. Like many money changers in Seoul, four major currencies, namely, American Dollar (USD), Euro (Eur), Japanese Yen (Yen) and Chinese Renminbi (RMB) are well accepted here. If you hold other currencies such as Hong Kong Dollar, Malaysian Ringgit, Singapore Dollar, Philippines Peso, don't be discouraged. Just ask, some money changers in Myeongdong are willing to accept them. Is it better to bring US dollars in cash or traveler's checks? Do you know which gets better rates? what is the operating hours of the money changers in myeongdong? You can find many money changers in Myeongdong operate from 10am to 10pm. What about pakistani rupee? Can they exchange it? What about pakistani rupee ?can they exchange it? hello myrah naeem, I think pakistani rupee is not commonly exchanged at Seoul. Maybe safer for you to bring USD, Euro, RMB or Yen. 20australia coin in silver change to Singapore dollar How much?? Do money changer accept old USD100 notes? Money is money everywhere. They will accept it. How old are yours? can you exchange British pounds sterling? Yes, there are money changers in Myeongdong that exchange British pounds (not all though, just ask around and you can find). Yes, many money changers are open weekends. The operating hours are normally from 10am onwards up to 10pm. Do they accept ringgit (myr) nowadyas in korea myengdong ?thanks..
USD, Euro, Yen and RMB are widely accepted by money changers in Myeongdong and Seoul. MYR is also accepted by some money changers in Myeongdong (but not all). You can ask a few money changers before exchange to get better exchange rate. Yes, Australian Dollar is accepted in some money changers (but not all). Do you think it is possible to exchange Swiss Francs? Do you think they accept it in Myeongdong or in a bank? Or would it be better to exchange it in euros 1st? (but that way I would lose a lot of money). Thanks. I believe you can exchange Swiss Francs in bank but street money changer may not accept it. Euro is accepted everywhere here and the rate is better too. So you won't loss a lot of money if you exchange Euro because the rate is very competitive. hi, may I know which exit should I take? Hi there, Is New Zealand currency acceptable for street money change in Myeongdong? 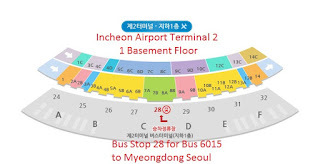 For sgd1000, how much korean won can i get?